General Characteristics: Medium in height, erect, moderately stocky, maturing in 12 to 15 months, producing from 5 to 10 oha; distinguished from other Piko by dark green petioles and pinkish base. Petiole: 65 to 100 cm. long, dark green, usually edged narrowly with dark pink or red, light pink at base with pink ring. Leaf blade: 30 to 45 cm. long, 25 to 35 cm. wide, 20 to 35 cm. from tip to base of sinus, ovate, nearly horizontal, chartaceous, light to dark green; piko whitish; lobes obtuse with narrow sinus. Corm: Flesh white with slight pinkish tinge near apex and yellowish fibers; skin cream-colored. 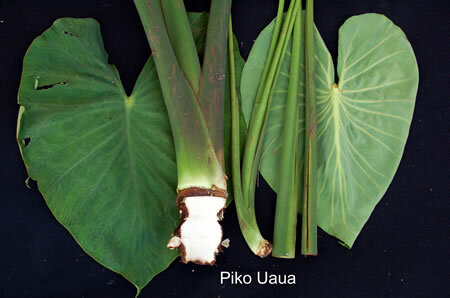 Origin, and derivation of name: Native variety; the descriptive name Uaua, meaning "tough," indicates that the extensive root system makes this variety difficult to pull under wetland culture. Distribution: Throughout the islands under both upland and wetland cultures; grown most extensively in Waipio Valley, Hawaii, under wetland culture. Remarks: This is one of the hardiest of the Piko taros, and probably the only one grown to any extent under upland culture.